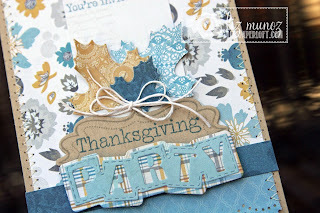 Liz's Paper Loft: MCT Day 3 of August Release Sneak Peak ~ Thanksgiving! 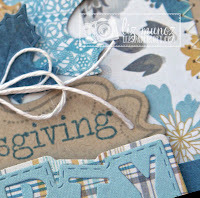 MCT Day 3 of August Release Sneak Peak ~ Thanksgiving! 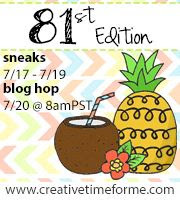 Oh my goodness today is already Day 3 of My Creative Time's August Release! The projects from my design teammates have been AMAZING! I know you've been enjoying them as much as I have. A little bit of stitching and some hemp, give this invitation the right amount of texture. Make sure you stop by the rest of the girl's blog! Miss Liz I'm so in love with this. I love the colors, papers and the use of MCT die. Liz, I love that you have used different colors than the traditional Thankgiving! This is a fun invite! Your card is sooooo beautiful I love the fall colors have to say blue and the different shades of brown are my favs. Love how the doily die works your card has the feel of shaby chic! It's awesome how you worked the new items with several of the oldies. You are just so talented! Your are so talented Liz! Love this card. It is so beautiful! The colors are awesome. Thanks for the inspiration! Such a FAB invite Liz!! 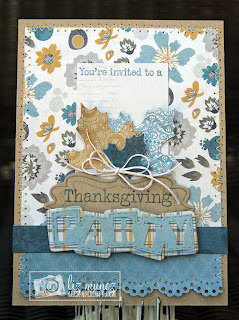 SO LOVING the colors, texture and of course the awesome stamps and dies!!!! Thanks for sharing my friend and have a GREAT hump day!!! What a beautiful card! Love the layout and the color combo you used! 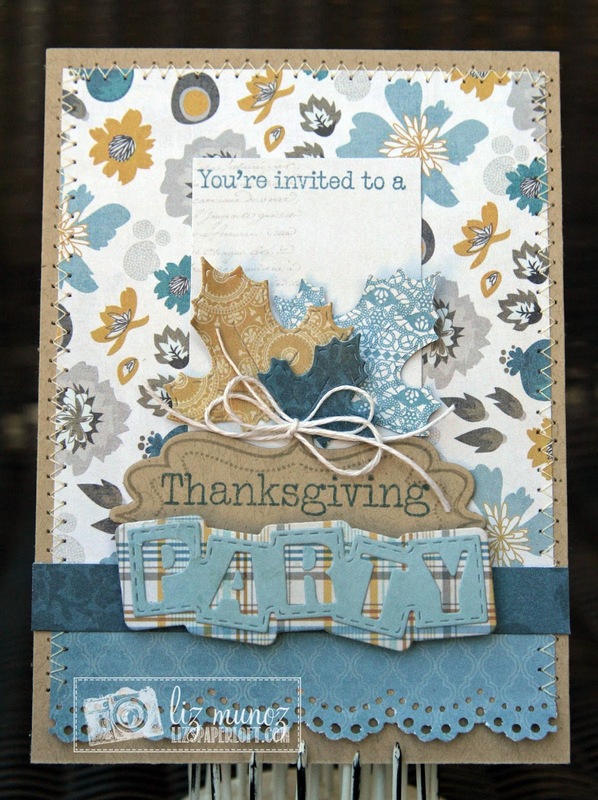 This is a beautiful Thanksgiving invite Liz! I love the papers you used and the stitching on the card!! 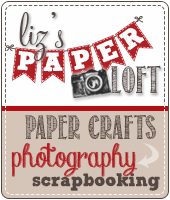 Of course I am loving the dies and stamps from this sneaky peak!! You ladies are so awesome with the versatile ways you show us that these dies can be used!! Thinking about Thanksgiving already give me a tummy ache but I love this card. Incorporating blue in a fall card is sure to set it apart! Beautiful party invitation. I love the color combo of blue and brown together. Very classy! Great desgin. Love the card. I love the colors you have used here - so soft and pretty. Stunning design Liz. The colors are beautiful and the blue is a great alternative to the traditional Fall shades. Wow, great invitation card and I love the colors you picked, thanks for sharing. WOW yet another way to use this set. Thanks for sharing. Liz I love love love your card!!!! The colors are awesome too! Great Job on this card. can't wait to order them. What a beautiful card! Just love it! TFS. Love the Fall non-traditional colors. Super card. I like the colors and the fall related project...it shows how well this can be used for more. Love the fall leaves dies and the doily border is so pretty. Super job! this card is awesome!! I love the colors you used and the patterned paper is so nice!! thanks so much for sharing!! 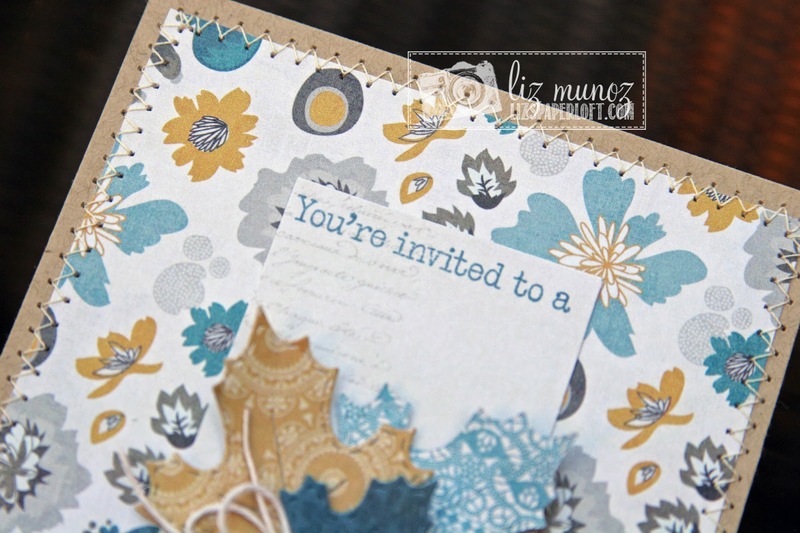 I love your BEAUTIFUL card invitation! The colors and elements of your card are AMAZING! You always create gorgeous projects....thanks for sharing :)! Have a wonderful day! Gorgeous card Liz, love the colors and paper you used. Wow, that is just gorgeous. I love the colors you used on this invite. I love these colors together, nice switch from traditional fall colors! Your invite is so lovely...who could say no??? Wow Liz you did an amazing job!! Very nice card - love the papers! What a very pretty card, I love the paper you used. TFS! This is a wonderful invite. Great colors. TFS. BEAUTIFUL!! The paper, colors, detail & dies - just an all around fab job!! 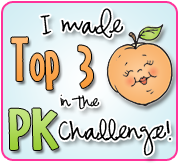 Love your paper choices for this super pretty card. the leaves are beautiful! This new release rocks! What a lovely fall card; love the focal point of the leaves. Your invitation is beautiful! I love the pretty papers!! 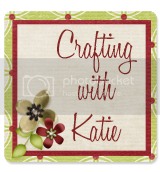 Gorgeous design my friend and you have done a fabulous job with the new stamps and dies! 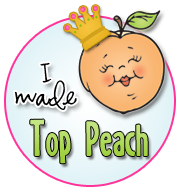 MCT August Release Blog Hop ~ Fly Away! MCT ~ August Release DAY 1 ~ Ghostly Greetings! 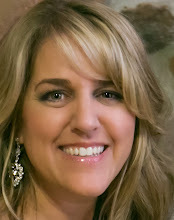 Inspire Me Tuesday ~ Happy Birthday! MCT 3D Wednesday ~ mini album! MCT Designer Challenge ~ Smile! Scrapping The Little Things ~ Just You & Me!